Aj and Andrew do not know AJ is going up as the pawn. They agree Suzette’s gone no matter who goes up beside her. Tom says that they have to watch out for Talla and Liza because Liza can easily manipulate. They agree that Topaz will be the one booted during the Double eviction. Tom says Emmett is going to have to take out Jillian. Emmett doesn’t think it’ll be a problem she knows this is a game. 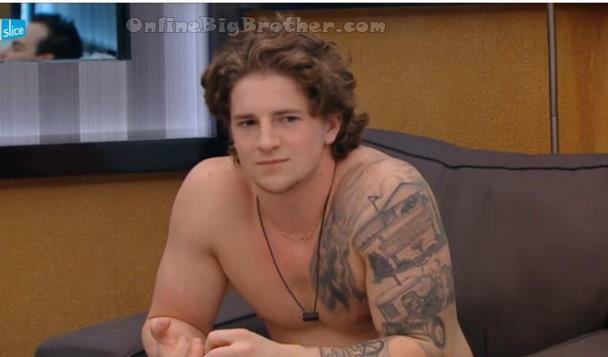 Emmett is worried about talla because they get another endurance competition Talla could win it. Liza wonders if her showmance with Tom will wreck her game. 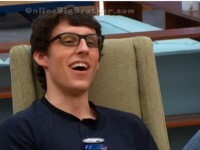 Peter: “You need to convince Andrew that winning HOH is so important to impress you. Liza and Peter confirm they are each others final 2. Peter: “I’m comfortable with dumping Emmett if you are comfortable with Dumping Jillian” Peter makes a comment that he hopes some the power flips to make the game more interesting because right now he’s feeling board. 12:00AM While Liza and Peter plan the game this group chit chats about comps in the housetub. We can only hope they clue in on what is happening and maybe win a comp. 12:20AM Showers Jillian, Garry and Emmett Emmett is throwing shaving gel at Garry. Garry tosses shaving cream at Emmett. AJ thinks he can get a bit further with Tom and he’s not worrying that he’s going up on the block this week. Andrew is thinking more short term next week and the week after. Andrew wonders if Emmett wins he’ll put them both up. Aj doesn’t think so he’s thinking GArry is going up and as long as one of them is off the block they have a shot. Andrew says it’s pretty obvious that Tom and Garry made a deal. He’s not too confident that Garry would be going up. Wonder about Aneal. Andrew brings up that Tom use to be all about putting getting rid of Jillian and now he never mentions it. Andrew wonders if there is some deals between those two. Big Brother tells AJ to get his microphone out of the water. Aj gets out of the hot tub lights up a smoke. Says they are higher in Toms pecking order, 10th or 11th.. “Thats 3 weeks away” Aj doesn’t think he’ll some moves until later. Andrew starts giving AJ suggestions about what to say when he goes and talks to Tom. He thinks they need to get something out of AJ going up as a pawn. Aj agree he’s going to give it some thought. Tom isn’t too happy with Topaz apparently she didn’t congratulate him when he won his second Power of Veto competition. Tom wonders why there isn’t any one from Quebec because they held a casting event there. Liza wants to tell him something secret that he can’t tell the bromance. She’s sure that Emmett and Tom will be nominated. they were trying to cop a feel! and Liza grabbing at his gear! seemed like a thousand years. OMG – if Peter smiled he’d look like Mr. Jones! I really hope one of the 4 guys or their “chicks” don’t win the next HoH. Suzette has went from being an undercover racist to being pretty blatant about it. I hate bigots no matter who they are, so I can’t wait to see her gone. Peter: “We can convince her that she wants her self out”,,,,,OMG that is so funny ans so true!!!! Talla is so scattered I’m surprised she makes it through the day.